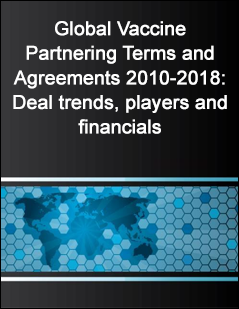 The Global Vaccine Partnering Terms and Agreements 2010-2018: Deal trends, players and financials report provides comprehensive understanding and unprecedented access to the vaccine partnering deals and agreements entered into by the worlds leading healthcare companies. This report contains a comprehensive listing of all vaccine partnering deals announced since January 2010, including financial terms where available, including over 1,000 links to online deal records of actual vaccine partnering deals as disclosed by the deal parties. In addition, where available, records include contract documents as submitted to the Securities Exchange Commission by companies and their partners. The report takes readers through the vaccine deal trends, key players and top deal values allowing the understanding of how, why and under what terms companies are currently entering vaccine partnering deals. The report presents average financial deal terms values for vaccine deals, where available listing by overall headline values, upfront payments, milestones and royalties enabling readers to analyse and benchmark the value of current deals. The middle section of the report explores the leaders in the vaccine partnering field; both the leading deal values and leading players are reported allowing readers to see who is succeeding in this growing market. This chapter also looks at the contributions by the big pharma and big biotech companies of the world in terms of deals made. One of the key highlights of the report is that over 1,000 online deals records of actual vaccine deals as disclosed by the deal parties are included towards the end of the report in a directory format that is easy to reference. Each deal links via Weblink to an online version and all these deals are organized by company A-Z, stage of development at signing, deal type (collaborative R&D, co-promotion, licensing etc), specific therapy and technology focus. In addition the report includes actual contract documents where available as submitted to the Securities Exchange Commission by companies and their deal partners. Finally the report concludes by looking into the future of vaccine partnering. With so many innovators looking for the next big thing in the field, the report selects companies to watch who are predicted to become big in the field based on their current dealmaking and financial trends. Throughout the report various tables, figures and graphs are embedded in order to illustrate the trends and partnering activities of the vaccine field. By the end of the report prospective dealmakers will have gained a thorough understanding of the partnering landscape of the vaccine market and will be familiar with the values and structures of the deals being signed within it. Global Vaccine Partnering Terms and Agreements 2010-2018: Deal trends, players and financials is intended to provide the reader with an in-depth understanding and access to vaccine trends and structure of deals entered into by leading companies worldwide.